Onions are a favorite staple in the kitchen, and their health benefits and distinct flavor make them an essential addition to cooking. But how many times have you skipped over them to avoid the discomfort of burning eyes when you chop a fresh onion? We have the solution for you! Try dehydrated onions which are already chopped and ready to use in your soups and stews. Now you can have all the nutrients of a bag of fresh onions in a space-saving jar. You’ll be crying tears of joy when you add dehydrated onions to your pantry! Using chopped onions in your cooking has never been so easy! Whether you’re on the trail, traveling in an RV, camping, or simply home in your kitchen, dehydrated onions will make your meals easy and delicious. Simply rehydrate with one-part dried chopped onions and two parts water and use as you would fresh onions. For soups and stews, you can simply throw the dried chopped onions directly in the pot and simmer for 10 minutes. These onions are so yummy you can use them dry too. Sprinkle some dried onions on your baked potato with some Harmony House Foods vegan bacon bits for an easy, tasty, and healthy treat! We take pride in bringing you the highest quality dehydrated products. That’s why all of our packaging is BPA free. Our clear jars, jugs, and zip pouches show off the vibrant colors of our products so you can see exactly what you’re getting. Each of our dehydrated and freeze-dried fruits, veggies, and beans are non-GMO and guaranteed to be free of heavy metals and pesticides. The long shelf life of 12-24 months means you can enjoy the ease of dehydrated foods for years to come. We’d love to talk to you and answer any questions you may have. 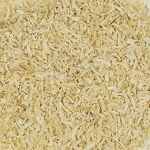 Give us a call at 1 (800) 696-1395 to buy your order of dried onion flakes today. Welcome to the Harmony House Foods family!